Welcome to our Forest Freedom School Blog! This is the first of our monthly blog posts to keep you updated with the goings on at the Forest Freedom School. Each month's post will be live at 10 am on the first Saturday of each month. We hope you enjoy it! Over the past few weeks Sequoia class has been grappling with maps, map-making, orientation in space, and thinking about why making our own maps is important. 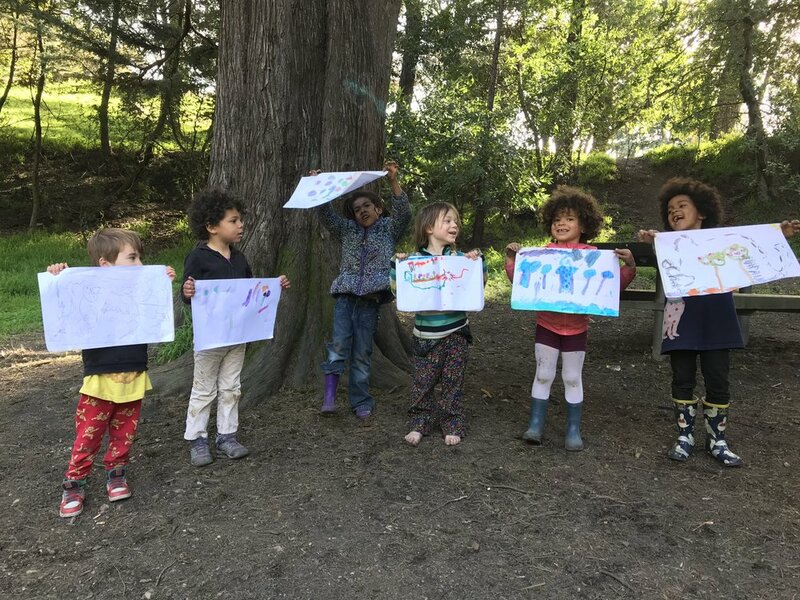 We examined large maps of California, charted our own map of the garden, identified important landmarks of one of our spots in the forest, and began painting our own maps of the forest. This "research" has also included thinking about and measuring distance, which involved measuring the length of the scent garden with sticks as our measuring unit (it is roughly 112 1.5ft sticks long!) and using our feet as measurement units to measure the distance from the Lake Temescal sand dunes to the waters edge. We have been working on, and will continue to build skills in recognizing, writing, and adding and subtracting numbers 0-10. Additionally, we have been enjoying making up collective stories as a group during lunch - with each person adding a "what happens next" to the twisting plot. Over the next month we will continue practicing writing numbers, reading, writing, and storytelling. We will also begin developing research questions about gentrification, through learning with and about Aunti Frances, a Black elder, community leader, and former Black Panther who is fighting her eviction from her home in North Oakland. 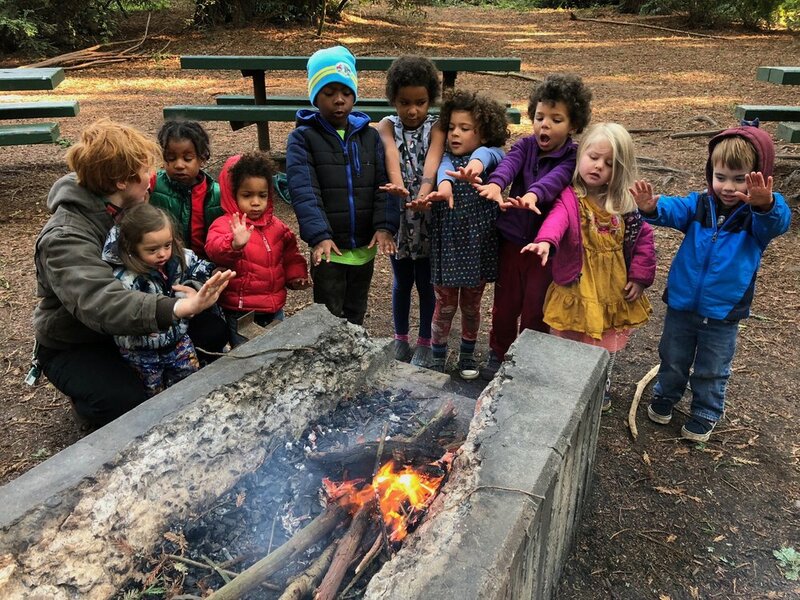 Also, many of our community members have turned five, and in our school community a part of that right of passage a whittling knife and flint fire starter! Be sure to ask your 5 year old the safety rules for these awesome new tools. Looking forward! What an exciting month it has been for Birch class! We have loved having new friends join our community, and building new relationships! 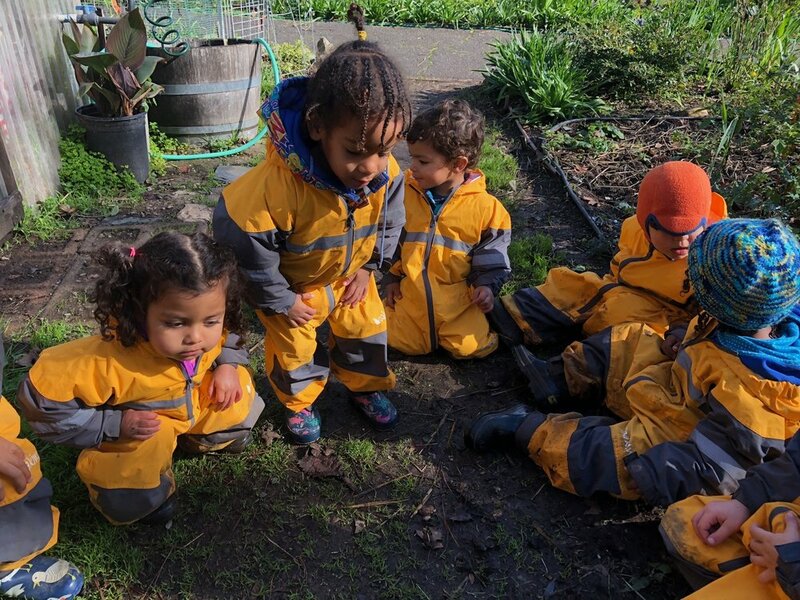 The rain this month has been a very important ingredient in many of our cooking recipes; and we have thoroughly enjoyed learning about colors by collecting flowers, leaves, and tools in the garden. 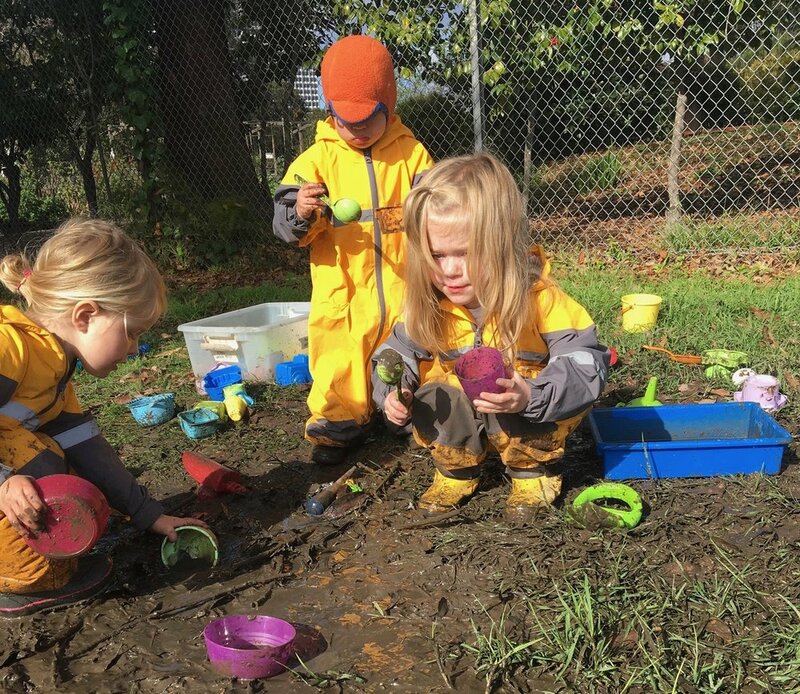 We are looking forward to continuing to explore new places and trails in the forest together, and investigating all the things that water can do (can water turn colors? can it be solid??). We will also begin to explore the names of different shapes through shape hokey pokey and objects we find in our adventures! Freedom Fighter's have birthdays too! This month we celebrated Angela Davis's birthday! We used flowers to paint a collective picture for her, while we learned about how Angela Davis was a feminist and fought for all black people's freedom by organizing her community and speaking out against the injustices she saw and experienced. We also learned she fought especially hard for prison abolition (no more jails!!). It's almost time for our next Forest Freedom Community Day! We are so excited to try out our new community building format. Please be sure to fill out the form so we can set a date and location! Be sure to fill out our 2018 - 2019 contract renewal form, if you haven't already! You can find more pictures from the last few month in this folder! Last but not least, thanks to Janna (Sonny and Shelby's mom) and Emmane (Naya's mom) for volunteering to be our first Community Liaisons! If anyone else is interested in joining them in these roles email maddy@abundantbeginnings.org.